Moise sews. People can say what they want to. He doesn’t care. Excuse me, that’s Doctor Moise. At least he will be when he officially receives his diploma from successfully graduating from his Ph.D. program in electrical engineering. All that stand between him and that piece of paper—and the career of his dreams—are a few unpaid fees. And the faster the needle on a sewing machine darts up and down, the faster he’ll make up that difference. That Moise is a refugee makes his story all the more remarkable. When he brought his family to South Africa, all his higher education amounted to very little. As a refugee, employers were reluctant to hire him. Locals are suspicious and distrustful of refugees, and language barriers mean refugees have a hard time communicating or integrating into their new communities. On top of his Ph.D. classes, Moise looked everywhere for a job, with no luck. As a husband and father, without a way to provide for his family, the stress and shame piled up in his heart. He had to do something. Anything. That’s how Moise found himself with a Singer sewing machine sitting before him, the only man in a room of 24 women in a training program you supported. He felt out of place at first. But then again, most of the women felt out of place too. They were all refugees from every corner of Sub-Saharan Africa. They eyed each other warily—these people with customs and beliefs different from them. But they all had one thing in common, Moise included: They were trying to make a new life for their families in a new country. Before long, their differences faded into the background, and friendships started forming. The women welcomed Moise as one of their own, and together, they cheered each other on, celebrating accomplishments and sharing struggles. Past program graduates often stopped by to showcase the quality of their designs and inspire students with their stories of starting small businesses. Many women in the class started making plans to pool their resources and open their own businesses together. After six months, Moise had learned to make all kinds of things: wedding outfits, school uniforms, curtains, pillowcases, jackets, handbags, and more. He hoped he could join a tailoring business when the program ended. In December, Moise attended his second graduation of the year, this time from the sewing program—in full cap and gown. With certificate in hand, now came the hard part: making a living off this skill. Without enough money to buy his own sewing machine, Moise was hard-pressed for work. Thankfully, he found another refugee woman with an alteration shop who was willing to let Moise use her machine when she closed for the weekends. Every Saturday and Sunday, Moise furiously sewed anything he could think to sell in the markets. It’s slow going, but Moise is chipping away at his school fees and steadily saving up to buy his own machine so he can work from home. With everything he sells, he’s inching closer to those three valuable letters behind his name and a life of prosperity for his family. Moise is proving that sewing isn’t just a woman’s profession. More importantly, he’s proof that job skills are critical needs for both men and women to provide dignified lives for their families. 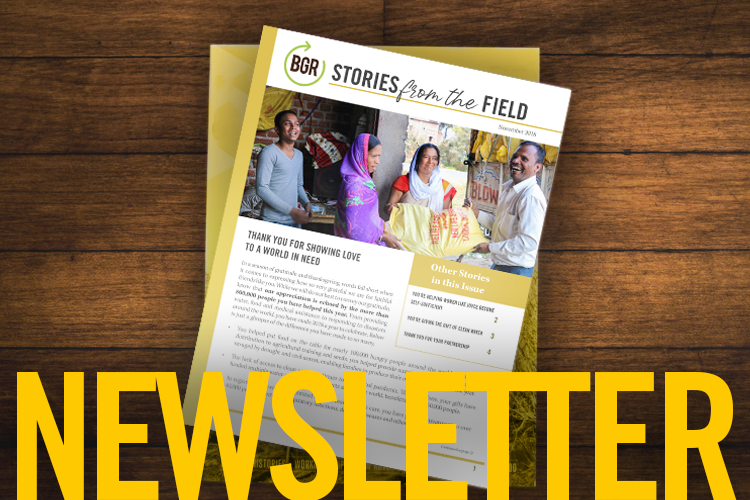 Empower another hard-working parent by funding a sewing class for five people or providing vocational training and tools from the BGR Gift Catalog.